For practicing physicians, we offer courses and other resources highlighting recent developments in patient care and research. 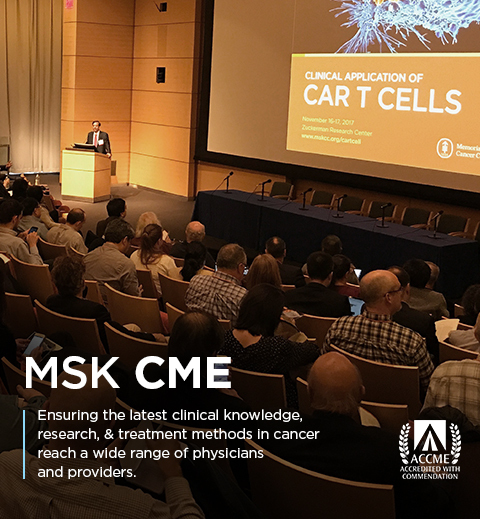 The goal of the Continuing Medical Education Program at Memorial Sloan Kettering is to disseminate current and new knowledge of the etiology, prevention, diagnosis and treatment of cancer, and allied diseases. The offerings are also intended to enhance the training of physicians and other health care professionals. The content of the activities is designed to include new research findings, clinical knowledge, and treatment modalities and their applications to various types and stages of cancer and allied diseases. New to MSK CME? Create an account to register for one of our upcoming courses. View a complete listing of all upcoming CME courses taking place at MSK.